Random Thoughts of Gil Camporazo: Why a Spoonful of Rice? Why a Spoonful of Rice? 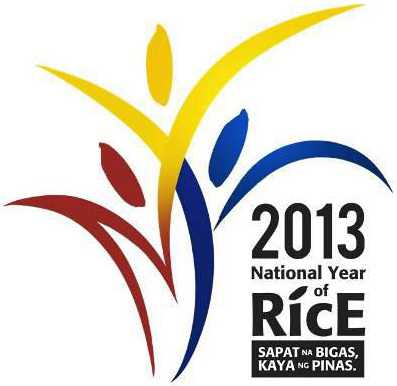 The PH government is campaigning to attain rice sufficiency starting this 2013. 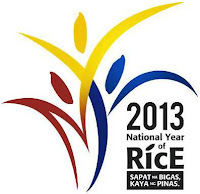 Thus, year 2013 is considered as the National Year of Rice by the Filipinos. By virtue of Presidential Proclamation no. 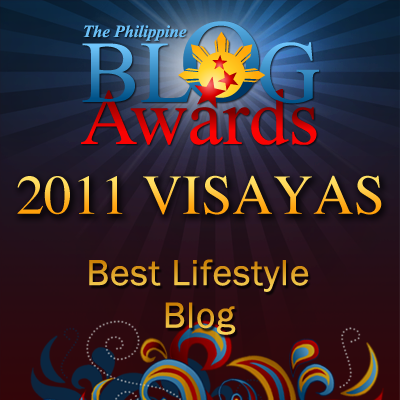 494, dated October 18, 2012, every Filipino is enjoined to support this campaign. It aims to promote responsible rice consumption for better health and less rice wastage and productive farming through the promotion of efficient technologies and inspiring farmers to do better. In our school, I have introduced this to the pupils in all grade levels. In one of our Monday flag ceremonies, one of our female school teachers led the pupils in reciting the "Panatang Makapalay". Before they were dismissed to proceed to their respective classes, I expounded to them every feature of this rice pledge and why it should be followed not only in principle by in doing it in toto. As a Filipino, I jointly pledge not to waste cooked rice and palay. I will cook sufficient rice and will see to it that it is well-cooked. I will take a plate of cooked rice enough for me to eat that nothing be left in my plate. I will do the same during occasion or when I eat outside. I will eat brown rice too, including other foods like banana (saba), sweet potato and corn. I will teach other this proper consumption so that farmer's sacrifice may be given importance and this would help raise enough palay for the Philippines. 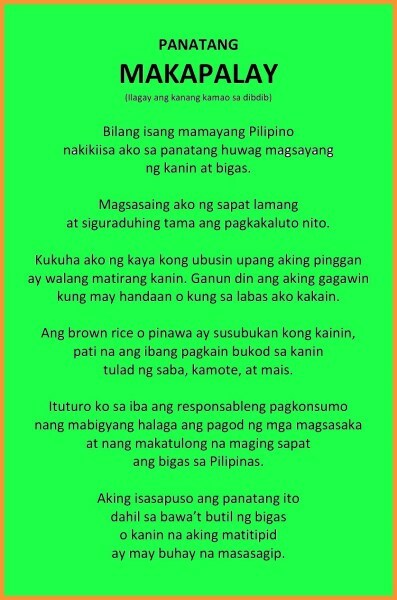 I will learn this pledge by heart for every grain of palay or cooked rice that I will be saving, there is a life is saved. Our school is advocating this rice sufficiency campaign. Our pupils and their teachers are very willing to follow this pledge by heart. This is what I learned from my late mother when I was still a kid. Curious as I was, I kept in observing her every time she cooked our food, particularly the rice. I noticed she took a scoop or a spoonful of rice from the pot which she already filled with rice to be cooked and placed it in an empty large bottle. This was a routine for her every time she cooks the rice. I was wondering why she was doing this. I surmised that my mother would be playing "bahay-bahayan" (playhouse) that she would be playing cooking using a real rice. Now, the appropriate time arrived to know the reason why my mother was doing it. It was sometime in early 60s when the supply of rice in our place became insufficient. My late father was traveling to nearby towns and municipalities just to buy a kilo of rice for three of us. While my mother was waiting for my father and it was already almost dark, I noticed my mother got hold of that large bottle almost filled its rim with rice. She poured those rice to an empty pot and prepared it to be cooked for our supper. It was almost evening when my father arrived with a medium paper bag of a milled corn, not rice. He directly gave it to my mom who was at the kitchen at that time. He was surprised to know that the dining table was already set with some rice on the plate for everyone of us. He was wondering where did my mother got the rice and cooked it. My mother told him that she saved it for several days every time she was cooking. I learned therefore the value of saving for rainy days. I never forget this. I even retold this important attitude of saving conscious for rainy days to our children, to our grandchildren and even to my closed friends and job associates. Thank you, Nanay (mom) for this practical lesson in life I learn from you.